Scientists have called for a wide-scale ban on the use of sonar to protect whale populations after a study highlighted a link between the military sound pulses and mass strandings in which dozens of the mammals have died. Marine biologists have long warned that the creatures' senses could be damaged by sonar, with the unfamiliar noises coming from vessels confusing the animals. Experts said the mammals often attempt to swim away from the sound source, leading them to become disorientated. For deep-diving marine life such as the beaked whale, which was the focus of the study, sonar can lead the animals to ascend too rapidly, causing decompression sickness. This in turn has contributed to an increase in the number of whales dying in mass stranding events. Researchers at the University of Las Palmas de Gran Canaria focused exclusively on beaked whales in the seas surrounding the Canary Islands. 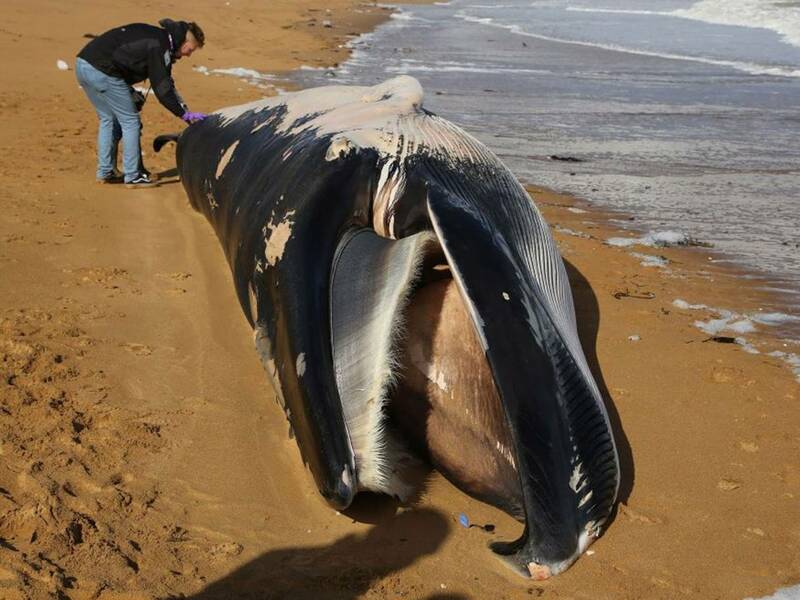 They found that a sonar ban introduced there in 2004 had been effective in reducing whale strandings and called for more sites to be established to prevent further deaths, including in the Mediterranean, where beaked whales are listed as vulnerable. Beaked whales regularly dive deeper than one kilometre for longer than one hour, but when exposed to sonar they may dive for more than two hours to a depth of nearly three kilometres. Peter Tyack, professor of marine animal biology at the University of St Andrews, said exposure to sonar "pushes some whales over the edge – some lose their ability to manage gases under pressure, causing gas bubbles that can injure or kill, and some strand on the beach and die". He told The Independent: "Current policies are not protecting marine life in UK waters. We need better monitoring of sound in the ocean coupled with policies that reduce exposure of vulnerable species to tolerable limits." Sonar was developed in the 1950s to detect submarines – and mass strandings of beaked whales were rare before this point. But between 1960 and 2004 there were more than 100 mass strandings reported and the number of species affected by the pulses increased. In one case shortly before the Canary Islands ban, fourteen whales beached during a Nato drill involving sonar. Strandings in 1985, 1988, 1989, 1991 and 2002 also coincided with naval exercises. As recently as last summer five whales died along the Irish coast in a suspected sonar-related incident. found beaked whales not routinely exposed to sonar displayed the most extreme behavioural and physiological responses, while those inhabiting seas where sonar was routinely – or never – used were least affected. The latest study's findings suggested that animals which had not become accustomed to the sonar sounds were even more at risk than those which experienced them frequently. Sarah Dolman, policy manager at Whale and Dolphin Conservation who was not involved in the study, said the latest research confirmed that beaked whales were "very vulnerable" to military exercises. She told The Independent: "We have seen the likely effects of military activities on our own shores, including with the recent mass stranding of more than 80 Cuvier’s beaked whales off Ireland and Scotland. Experts have said that this event may have been so devastating as to affect a whole beaked whale population, yet nothing has changed. "We might lose beaked whales around the UK before we even understand them." The United Nations and other international bodies have warned that sonar is a major threat to the animals. Previous studies have warned about the impact on the basic biological functions – such as feeding and mating functions – of whales and other marine life, including dolphins. In 2008, the Ministry of Defence admitted that the Royal Navy had been conducting operations close to the Cornish coast where 26 dolphins had died, after having previously denied having any vessels in the area. The MoD said it was “extremely unlikely” the animals died as a result of the sonar, but most-portems revealed they had no obvious signs of disease when they died after becoming trapped at four sites on the River Percuil. Peter Evans, of the SeaWatch Foundation, told The Independent: "Beaked whales will always be vulnerable to behavioural disruption and physical damage from loud noises produced by navies using mid-frequency active sonar. The ban on military activities in local waters introduced around the Canary Islands goes some way to reducing the harm this can cause. "However, there are many areas where naval manoeuvres occur that may not receive such protection. It is therefore important that well-monitored locations are used for such routine exercises and if beaked whales also occur there, that appropriate mitigation actions are applied." Travis Park, fellow at the Natural History Museum, which runs a UK whale and dolphin stranding project, added: “Whilst I don’t think there will be a ‘one size fits all’ approach to reducing anthropogenic mass stranding events, this is certainly an approach that has merit given its success in reducing the number of these events in the Canary Islands. “Unfortunately, each species or even each population may require a slightly different strategy, which makes it a more difficult problem to solve."